Has AWI misled Senate Estimates on review recommendation 1.14.7? 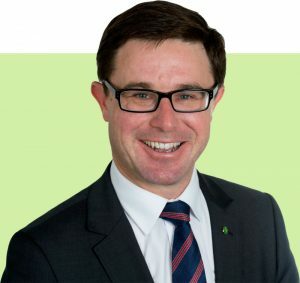 Agriculture Minister David Littleproud is disappointed AWI has not established a governance forum. AUSTRALIAN Wool innovation has been allowed to avoid industry scrutiny of its plans to implement key governance changes, despite a clear recommendation by the independent Ernst & Young review. AWI’s failure to establish a governance forum by October 31 this year with wool industry and Department of Agriculture and Water Resources representation is in direct contravention of ‘critical’ review recommendation 1.14.7. This is despite AWI chief executive officer Stuart McCullough claiming at a Senate Estimates hearing last month that the research, development and marketing company had agreed “outright” to 75 of the review’s 82 recommendations, which would include 1.14.7. Recommendation 1.14.7 states that that any deviation from the recommendations made in the EY review report should be approved through the proposed governance forum. AWI lists the ‘EY due date’ for recommendation 1.14.7 as 31 January 2019 on its the Review of Performance Implementation Portal or ROPIP. Five other recommendations slated for a shareholder vote and two others agreed to in-principle by AWI make up the total of 82 recommendations that Minister for Agriculture and Water Resources David Littleproud has requested AWI fully implement. Mr Littleproud today said he would be writing to AWI this week about its failure to set up the governance forum. “AWI agreed to set up the governance forum by October 31 and sheep farmers have been telling me today how disappointed they are this hasn’t been set up yet, as am I. “AWI should not disrespect the process or their levy payers,” he said. Is DAWR working for AWI or taxpayers? AWI’s failure to comply with the governance forum recommendation and intervention on AWI’s behalf by Mr Littleproud’s deputy, assistant Agriculture Minister Senator Richard Colbeck over a legal advice request at last month’s Senate Estimates hearing, has heightened industry concerns about AWI’s intent and the role played by the department in the review’s implementation. When Mr McCullough’s was asked why AWI had not formed the governance forum by the due date, his response was that “the forum was established with DAWR as a weekly monitoring group to monitor progress of the review and enable timely action to be taken as required. However, Sheep Central has confirmed that AWI has not contacted peak wool grower body WoolProducers Australia nor the Australian Wool Growers Association to establish the governance forum as recommended by the EY review. Nor has either body been involved in the weekly monitoring group. Mr McCullough has refused to discuss AWI’s response to the EY review with it’s own Industry Consultative Committee, instead referring members to the ROPIP. Mr McCullough’s also said that at AWI’s six-monthly Statutory Funding Agreement meeting with DAWR on 27 August 2018 it was agreed that AWI and DAWR should continue to meet fortnightly “to discuss this ongoing progress with the implementation plan for the foreseeable future. Mr McCullough said to assist all stakeholders monitor AWI’s progress on implementing the recommendations in the 2018 review of performance and governance, AWI has developed the ROPIP. The portal provides weekly updates on progress against each recommendation. A DAWR spokesperson said the AWI board is independent of the department and is responsible for implementing the review recommendations. “The department has met and heard from AWI about its response to the review’s recommendations. “The department conveyed to AWI that if it is proposing to implement a review recommendation in a way that is different to that proposed by EY, then it would be prudent for AWI to explain this in its implementation plan and identify how the alternative approach meets the intent of the recommendation,” the spokesperson said. WoolProducers Australia chief executive officer Jo Hall said as an agri-political lobby group, it was WPA’s job to contact the department and the Minister’s office regarding the governance forum issue. “We find AWI’s response to this completely unacceptable and we simply do not believe that this can be regarded as one of the 75 recommendations that they deem as complete, as they have not even attempted to implement it; however, AWI is claiming it as complete,’ she said. “The minister has not made any public comment on the latest implementation plan, but has made many public comments previously regarding his expectation that all 82 recommendations must be implemented or he will be left with little choice other than to use legislative powers. AWI has also been allowed by the department to abrogate the EY review’s timeline for recommendation implementation by adding an ‘actual date’ to the ‘EY due date’ on its ROPIP. AWGA director and AWI Industry Consultative Committee member Martin Oppenheimer said AWGA was not contacted by AWI about the governance forum. “They (AWI) are just treating us with total disrespect and disregard. “They don’t want to know what we think, they haven’t shared information with us, they don’t want to consult with us,” he said. “It really is an impossible situation. “It’s just so clear that this AWI board does not want to make the changes necessary and I don’t know how we, the minister or anyone can expect that they are going to make the changes,” he said. “They have made it absolutely clear so there has to be an intervention. Ms Hall said AWI’s treatment of recommendation 1.14.7 is not the only issue WPA has with the AWI implementation plan. “In terms of the recommendations being flagged by AWI as being put to shareholders, we do not believe that 1.9.1; 1.9.10 and 1.12.3 need to go to a vote and is contrary to EY’s recommendations as they are governance issues and not constitutional. “Whilst AWI may believe they will change the ‘DNA’ of the company, it will be a change for the better to modernise the organisation and bring it’s governance into the 21st Century, which is no less than what woolgrower paying a compulsory levy to fund the organisation, deserve,” she said. His actions to prevent the release of the legal advice came on the same day that Mr Littleproud’s letter criticising AWI’s review recommendation plan was read at the hearing. “So I’m going to take on notice, pending some advice on the public interest immunity claim, the tabling of the legal advice that you’ve been seeking,” Senator Colbeck said. After lunch, Senator O’Sullivan withdrew his request for the legal advice from AWI. “From a conversation I’ve had with them, I’m satisfied it doesn’t hold. “As a signal, when it takes eight questions to actually qualify that a piece of legal advice exists, on a piece of paper, it will lead us every time to want to know what’s in it,” Senator O’Sullivan said. “It might have been more useful—it’s a lesson for witnesses—to be up-front; I might not have even wanted it. “But I will withdraw it, in the interests of not putting a lot of pain into the system,” he said. Mr Colbeck’s office later issued a statement that “the legal advice in question has not been provided to the department, nor Minister Littleproud or Assistant Minister Colbeck. AWI has refused numerous requests from wool grower bodies and Sheep Central for the release of the legal advice it has received pertaining to the review recommendations. It’s time for various organisations to realise that the AWI board is fully responsible to the levy payers first and foremost. It’s structure is democratic in that levy payers have a WoolPoll. It’s a pity to see some national senators attempt to destroy a democratic organisation. There are no votes in being positive. The tall poppy syndrome is alive and well in the Senate as they attempt to destroy AWI. As an observer of AWI – it has been very successful with its marketing in helping to develop consumer-friendly garments and managing to get a high profile champion of wool in Prince Charles to drive demand. The good work AWI has done has included shearer training, wild dog control, the ewe lifetime performance program to over 3000 sheep producers, the quiet work going on about addressing mulesing and pain killer development. Sheep producers now have a superior and cost-effective genetic evaluation system compared to our costly beef system. The recent ram sales on AuctionPlus clearly demonstrate how innovative the sheep industry has become compared to the beef sector. The other issue that AWI has had a positive impact on has been on the flawed and draconian Johne’s policies. The AWI-sponsored forum in Sydney helped sheep producers to manage the disease through the Gudair vaccine. The destructive senators need to stop trying to destroy AWI and focus on positive polices such as Roger Fletcher’s suggestion to merge the wool, mutton and lamb industries into a focussed democratic industry body responsible only to the levy payers. The small turnout in the WoolPoll would indicate that the silent majority are happy with the current prices of sheep products and don’t want change. They would have noticed that the chair of Bega Cheese has been there for 16 years and if levy payers are unhappy they have the right to use the democratic process and nominate for a board position. It’s as clear as daylight, or ought to be to everyone by now — the AWI board can give the Minister, the Government, the Opposition, the Senate Estimates Committee, wool grower organisations, the press and even the growers themselves, the thumbs up. And the board can do what they like as long as the chairman has a wad of the biggest wool growers’ votes in his hip pocket and the rest of the growers keep on voting for the wool tax to keep the “honey pot” topped up.